Setting with Roses tapestry shows a setting of roses in a blue vase with branches strewn on the table below. The style is rustic yet classic and is inspired by the Baroque and romantic Dutch master painters who used flowers to celebrate the beauty of nature and the art of bringing in a sense of nature into indoor life. 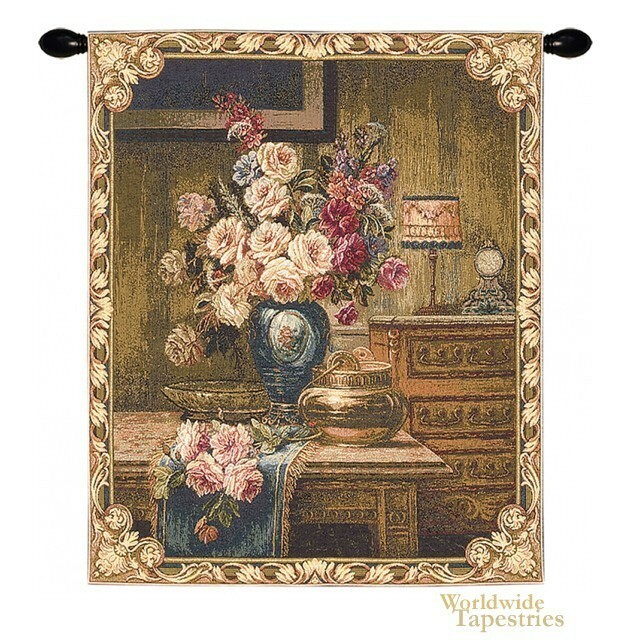 This Setting with Roses tapestry is backed with a lining and a tunnel for easy hanging. Note: tapestry rods and tassels, where pictured, are not included in the price. Dimensions: W 26" x H 31"